Seedstock recently interviewed Flora and asked him about how Renewable Farms made the Anaheim project happen, how the mega farm will remain sustainable and what he hopes this farm will achieve in the future. Seedstock: Can you give us a bit of your background with building farms? Aaron Flora: I’ve been doing these farms for about the last five years, doing a lot of international projects. I wanted to focus on training people how to do this kind of farming at home, so that I could train them and send them out to rural areas around the world. When I go and build a farm in Africa, it’s hard for me to maintain that farm while being home and maintaining others. So, I thought, why don’t I just build a big farm at home because there is plenty of need here, just like there is need out there. This way, I could be here training people and sending them out. Seedstock: How did this project get the green light? I had this dream about doing a mega-farm. Then the mayor of Anaheim made a comment on an online article about a farm that I built. I followed up on the comment, and asked to talk with him. I told him my idea of wanting to do an urban farm that would take care of low-income families; one that is also a community center, feeds the homeless, and provides jobs. He loved the idea and set me up with all the right people in the city. The City gave me land, and then Control Air, an Anaheim company, footed most of the bill for the farm to get built. That took care of the land and the finances. Now we are in the final phase and beginning construction. Seedstock: What any challenges did you face along the way? Are you concerned about anything now? Flora: I think the whole thing is exciting, but it’s also an exciting risk. There is nothing like this within the city. We’re building a farm that’s basically open to the public, run as a non-profit. 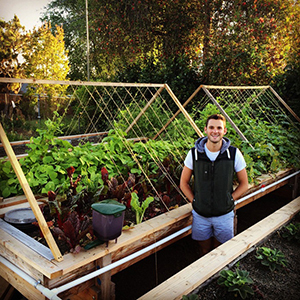 There have been community gardens forever, but this is like a garden on steroids. We are going to grow tons of veggies and have tons of fish, so I think that we’ll have to figure out how to manage people coming in, and distributing food, as well as running it. Juggling that is something I don’t have much background in. I’ve never run a grocery business or a distribution business, but I feel like I’ve got good people around me who can help. I feel confident that I will make a lot of mistakes, but I’ll figure stuff out. The attention that I’ve been getting, as well as the help and support, have been overwhelming — just the companies that want to purchase the food and other big businesses that want to help out, and people offering to make me web pages. People want to come and volunteer. There has been an overwhelming amount of support. My goal is to replicate this model throughout countries and in different urban areas in the states. Seedstock: What sustainable methods will the farm use? Flora: It’ll be organic. Also: I’m a big advocate of the ocean. I hope that somehow, people won’t see this just as a means of growing food, but also as a means of protecting wildlife and oceans. There are so many great aspects to this — not just providing food and jobs, but also helping the fragile ecosystem. We are in a desert and people don’t think about that everyday. That’s something the city was really excited about — saving so much water. I also want people to think through how they grow and live — the plastic bottles they use and their waste — things like that. I want to shine a light on that and influence people to do little things. That’s my sustainable goal — a little droplet in a big pool of ideas, trying to make things better. Seedstock: What’s your future goal for this farm beyond replicating it? Flora: My main goal is that the project supports itself. That it is a sustainable business. But I would like it to be a model — a training center. I’d love for people to drive or fly in from all over the world, and come and study. I am excited about doing classes every week where we teach people how to farm and teach them the science. I hope that one day this farm could show people how easy this stuff is, and for it to become a common thing that people know how to do. Like gardening; most older people know how to garden. Well, what if young people can grow up knowing how to do sustainable stuff and learn how to farm? That’s my big goal: To make this a training center.